Sing-a-Ma-Jigs only $5.99?! + MANY Other Great Coupons Deals at Target! Thanks to reader Christina for reminding me to check out the new Target coupons! 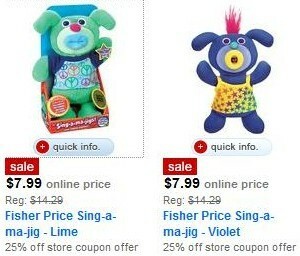 I noticed a 25% off Sing-a-Ma-Jig coupon (a recently discovered favorite toy of my son!) and they're on sale right now for $7.99. Now, that's an only price, but if they're also that price in store, I'll be able to snag one for just $5.99! There are currently 25 toy coupons and almost all of them are worth 25% off popular toys such as My Little Pony, Fisher Price, Pokemon, Let's Rock Elmo and many more. If you look in the Electronics coupons, you can save 10% on iPods, Tom Tom GPS system and Kodak items. Also worth a mention are the Clothing/Apparel coupons. You can save $4 on any woman's sweater allowing you to get a Merona sweater for only $4.99! Click here to check out the savings! NOTE: Lots of coupons can be used online too! If it can be, you see red writing on it with a code to use at checkout!